Was The Metals Market Manipulated To Drop From 2011 To 2015? It is a fact that financial markets go up and financial markets go down. That is what markets do over the course of time. And, if you intend on placing your money into the market, you must accept this truism. Yet, we have many trying to convince the masses that when metals go down and when equity markets go up it is all due to manipulation, and when they react in the opposite direction, then they are following their natural course. And, personally, I am sick of it. When we look back at 2011, and we read the articles being published back then, it stands out quite clearly how bullish 99% of the market was at the time. One would have to search long and hard to find an analyst who did not believe that it was a certainty that gold would eclipse the $2,000 mark. Yes, the analyst community got this one really wrong. Back in 2011, very few saw the top coming in the metals markets. While our analysts at Elliottwavetrader.net were warning investors to exit the market, and for aggressive traders to begin shorting, most analysts and market participants were still looking higher while the metals were topping. Very few others expected a top in the $1,900 region or the action seen in the metals market during 2011-2015. Most were advising investors to just keep buying, since they "knew" the market was certainly going much higher. But, when the markets began the correction we called for in 2011, those that were still looking higher became frantic. They had investors following their advice who were getting more and more angry with them as the metals dropped further and further. Surely, these analysts could not have been wrong. I mean, how could the metals drop rather than continue to rally? This was clearly not supposed to happen. There must be another reason, as they simply could not admit to those following their advice that they were simply wrong and were caught flat footed at the market highs. After the top was struck 2011, the manipulation theories began to take flight (especially when the metals market could not). And, as the metals began to drop precipitously, this became an easy scapegoat for the analysts who were caught looking higher. It was an easy out for them to tell their followers that they were really not wrong, since it was the big-bad-banks and the evil central banks who colluded to cheat everyone out of their money. The lower the metals dropped, and the more wrong these analysts proved themselves to be, the louder the manipulation cries became. In fact, and almost comically, many of them finally began to turn bearish towards the end of 2015 (as we were approaching the lows), after remaining staunchly bullish during silver’s 75% fall. 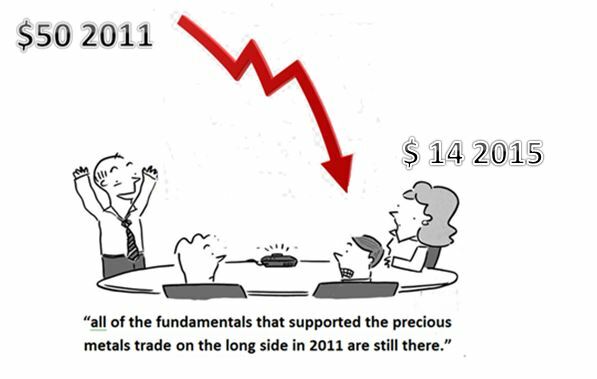 As we were approaching the lows in the market at the end of 2015, all these same analysts became certain that gold was going to drop below $1,000. In retrospect, they were the best contrarian indicators the market had to offer. And, their excuse was "manipulation," but never their own obvious failures. As we move into 2016, I believe there is a greater than 80% probability that we finally see a long term bottom formed in the metals and miners and the long term bull market resumes. Those that followed our advice in 2011, and moved out of this market for the correction we expected, are now moving back into this market as we approach the long term bottom. In 2011, before gold even topped, we set our ideal target for this correction in the $700-$1,000 region in gold. We are now reaching our ideal target region, and the pattern we have developed over the last 4 years is just about complete. . . For those interested in my advice, I would highly suggest you start moving back into this market with your long term money . . . So, let me provide you with the first question you have to consider if you believe in manipulation taking the market down from 2011 to 2015: If the metals were truly manipulated to drop from 2011 to 2015, how could we have pinpointed both the top and the bottom to the market? Well, that is, unless we were the ones who were doing the manipulation. (smile). Let’s examine the “substance” of the manipulation theorists claims a bit more carefully. Once you uncover their “reasoning,” you will see that their claims are nothing more than using quotes out of context to prove that a paper cut caused the market to bleed to death. If you read all the "proof" presented by the manipulation theorists, and really think about what it means, you would recognize that they are misleading their "believers" in one of two ways. First, they present statements taken out of context as "proof of clear manipulation." In the past, I have highlighted this commonly used method with an often-quoted statement by former Fed Chairman Alan Greenspan, which is used by the manipulation theorists as a supposed admission of manipulation by the Fed. Quite some time ago, I wrote an article explaining why I did not believe that the metals market was manipulated by the Fed to drop by 40% in gold and 70% in silver. A commenter to that article argued that even Alan Greenspan, in his testimony before the Committee on Banking and Financial Services in 1998, noted that there was clear manipulation by the Fed in the gold market. In fact, he took this information from a GATA paper written on this matter. This opinion is based upon one line in that testimony, where Greenspan stated that "central banks stand ready to lease gold in increasing quantities should the price rise." Sounds like he found the smoking gun, right? Not really, if you read everything he actually said. You see, these manipulation theorists quote only the sections of a proposition they feel supports their theory, while they ignore everything else said by that person. They simply take these quotes out of context in order to provide their own context and spin to the quotes. To hell with the truth. In our example of this supposed quote by Greenspan proving manipulation, if one were to actually read the entire paragraph cited by the manipulation theorists, you would realize that Mr. Greenspan was not claiming that the Fed was actually leasing gold to manipulate the price. Rather, Mr. Greenspan was discussing a hypothetical methodology which MAY combat an attempt at market manipulation in the gold market. Yes, you heard me right. Mr. Greenspan was not "admitting" that the Fed leases gold to manipulate the price, as the manipulation theorists would have you believe. He was discussing a hypothetical methodology through which the Fed MAY use to combat attempts at manipulation by someone else in the market. Again, it deserves repeating. Mr. Greenspan did not admit that the Fed manipulates gold. Mr. Greenspan did not even note that there was anyone who manipulated gold. Rather, he was saying that IF someone attempted to manipulate the gold market, the Fed MAY have a tool to combat such manipulation attempts. More importantly, he never even opined as to whether such a tool would or could even be successful. "Even with centralized execution or clearing, the most relevant attributes of these markets would not resemble those of the agricultural futures markets and hence would not be susceptible to manipulation." Yes, please read that again. Mr. Greenspan noted that the gold market "would not be susceptible to manipulation." The second method through which they attempt to prove wholesale manipulation is to point to evidence of small price manipulations and suggest that these "paper cuts" have caused the market to bleed to death. None of their supposed "proof" provides even a shred of clear evidence that the gold market was manipulated to drop over 40% and that the silver market was manipulated to drop over 70%. The latest supporting "evidence" to which the manipulation theorists proudly hang their hat is the recent news about Deutsche Bank's admission of "manipulation." Everyone now assumes they have found the smoking gun which "caused" silver to drop by over 70%, which proves they were not wrong to be bullish all the way down. Of course, they can now "prove" that everyone was cheated out of their money due to this "manipulated" decline of 70%. Right? Wrong. This was not the first case regarding market manipulation, nor will it likely be the last. But, what many do not point out is that the manipulation dealt with in these cases is not the "manipulation" to which all the analysts have been pointing to explain why silver lost 70% of its value when they did not see it coming. You see, the manipulation dealt with in these cases were attempts by these banks to move the market by a very small percentage in order to make a quick buck off a very small move which they attempted to control, often during low volume periods of market action. This is what is claimed within the actual legal complaints filed against these banks, which generally provide that the banks "manipulated the bid-ask spreads of silver market instruments throughout the trading day in order to enhance their profits at the expense of the class." Moreover, and quite importantly, this type of small degree "manipulation" occurred whether the market was going up or going down, and such manipulation was not geared towards only dropping the market lower, as the manipulation theorists want you to believe. Please read that again. It was not claimed in these lawsuits that the manipulation had the purpose of taking the market down as you have been led to believe. These lawsuits do not support the commonly held proposition that the market was "manipulated" to drop 70%, as in the case of silver. To claim that these small degree "manipulations" caused the market to drop 70% is complete unsupportable nonsense, and is only used as a scapegoat by those who have been very wrong about the market, but refuse to take responsibility for their decisions. While many will undoubtedly misread my conclusions as my claiming that there is no manipulation in the market, and post comments about how wrong I am about claiming there is no manipulation at all in the market, I suggest you actually read what I have said again. And, if you still cannot come to the correct conclusions, allow me to lead you in the right direction. I do recognize that there is "manipulation" in the market by larger market participants. But, as the cases on the matter clearly point out, these "manipulations" are of a very small degree of market movement, or, "paper cuts," as I have referred to them above. Moreover, as the cases also present, these small degree manipulations occur in both directions. Please read that again: THESE SUPPOSED SMALL DEGREE MANIPULATIONS OCCURRED IN BOTH DIRECTIONS. Therefore, my proposition is that such "manipulation" did not cause gold to drop by 40% and silver to drop by 70%. And, I will reiterate my proposition that proof of a "paper cut" is not what caused the market to bleed to death. Rather, we call that a market correction and not a market manipulation. Accept it. There is not a single market in the world that does not move in two directions over the short and intermediate term. However, overall, over the very long term, markets generally trend upwards. And, the reason financial markets trend upwards over the very long term is that society is generally progressing over the very long term. But, based upon the manipulation theorists' perspective, we should only progress in the price of gold and never experience periods of regression. From their perspective, the metals should act differently than any other asset on the face of the planet. You see, if one understands that markets do not move in only one direction over the intermediate and shorter term, then one would have been able to recognize that the market was topping back in 2011. So, the next time you consider giving any credence to the manipulation theorists, look to see if there was even one manipulation theorist that recognized the market was topping back in 2011, or if they were wildly - and wrongly - bullish at the time? I think we all know the answer to that question. So, could it be that their "theory" is attempting to mask their abject failure between 2011-2015? One really has to begin to question the motivation behind these manipulation theorists. What prompted them to head down this path? Well, let's be honest and recognize that not a single one of them recognized the top in 2011, as they were each wildly bullish at the market highs of 2011. They did not recognize the impending sentiment change in the market. They had no clue that the market was about to reverse. All they saw was a one direction market, and they looked quite foolish still looking for the market to "certainly" exceed $2,000, while the market was setting up to target $1,000. Do you think it would be good for business or their reputations if they were caught being so dreadfully wrong about market direction? They had no choice but to come up with something to save face. They needed a scapegoat. Even if you do not buy into the fact that markets progress and regress in natural due course, for the sake of your investment account, you should at least consider what 2011-2015 has meant to your investment account. We can all agree that the ultimate goal for every single investor is to develop the appropriate tools to align their investment account with price. Anything else is a side show or misdirection. So, if there is someone who is providing you with an excuse as to why they have been on the wrong side of price during a 50%+ draw down, for the benefit of your investment account, their perspective must be discounted, especially if they are trying to blame someone else for their failure. Is there any other market in the world where you would adopt or accept such excuses for being so horribly wrong? Then why are you so willing to buy into the specious claims of the manipulation theorists?